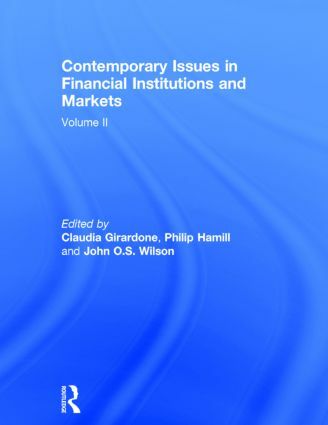 This book showcases recent academic work on contemporary issues in financial institutions and markets. It covers a broad range of topics, highlighting the diverse nature of academic research in banking and finance. As a consequence the contributions cover a wide range of issues across a broad spectrum, including: capital structure arbitrage, credit rating agencies, credit default swap spreads, market power in the banking industry and stock returns. This timely collection offers fresh insights and understandings into the ongoing debates within and between the academic and professional finance communities. Claudia Girardone is Professor in Banking and Finance at the Essex Business School, University of Essex, UK. Her research interests focus on modelling efficiency and productivity of financial institutions, bank mergers and acquisitions, bank corporate governance, competition issues and banking integration. She has published widely in international peer-reviewed journals and co-authored a textbook entitled Introduction to Banking (2006). She is on the editorial board of several journals including the Journal of Banking and Finance and the European Journal of Finance. John Wilson is Professor of Banking & Finance and Director for the Centre for Responsible Banking & Finance at the University of St Andrews, UK. His research focuses on the areas of Industrial Organization, Banking and Credit Unions. He is the author/co-author of books, a monograph, chapters and articles. His books include European Banking: Efficiency, Technology and Growth, Industrial Organisation: An Analysis of Competitive Markets, The Economics of Business Strategy, and Industrial Organization: Competition Strategy and Policy (now in its fourth edition with translations in Italian and Greek). John edited a Routledge Major Works, Banking. He also co-edited the Oxford Handbook of Banking (with Allen Berger and Phil Molyneux). Philip Hamill is Dean of The Institute of Banking, Ireland. His research involves theoretical and empirical analysis of financial markets with a specific focus on modelling stock market volatility, security valuation and corporate governance. During his academic career he has been seconded to work in the financial services sector and has been a consultant to both public and private sector organisations. His research has been published in a range of leading academic journals, books and professional periodicals including the Journal of Empirical Finance, Global Finance Journal, The Financial Review and the British Accounting Review.